A little flashback to early this winter with my loves, Christine and Murphy. 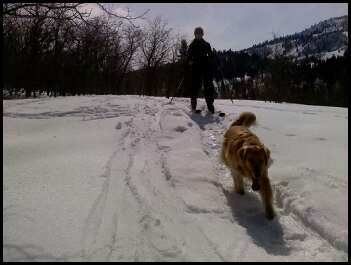 We did a little ski tour in the lowlands together and meadow skipped around. A nice sunny day with these two is always a real treat. Especially during winter because of the crazy busy schedules that Christine and I are wrapped up in that time of year. ^Murphy is showing Christine the way to her new favorite ski spot that her and I had found together. The trees are pretty tight especially on a low snow year, but we can still get in some good turns out there. 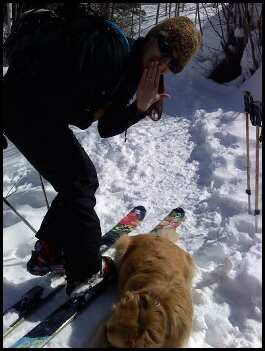 ^Murphy is taking a little break here while Christine and I are taking off our skins and getting ready for the downhill. The fall leaves were all holding on the scrubs in this one spot. It is kind of cool being amongst all the color in the middle of winter. Murphy is also drawn to the spot as well, which makes it even cooler to watch her get all excited and prance around in the color in anticipation for the downhill payoff she loves so dear. 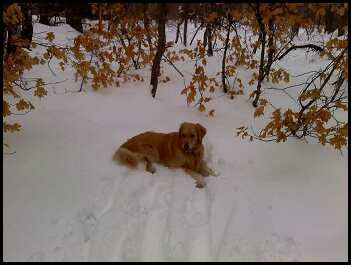 ^After a nice decent down to the creek bed it is time to dig some ice out of the paws. Christine poses up a silly one while Murphy gets to work on her paws. The creek is a nice finish to a nice little meadow skip. It is very tranquil to put the skins on and get ready to head back up with a trickling creek soundtrack. At peace. 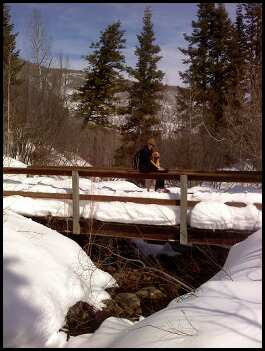 ^The trail footbridge is a classic photo opportunity not to be passed up. Murphy and Christine are posing one up for me here on the bridge. Murphy was super pumped to be skiing with her momma. Usually it is just Murphy and I and we are getting after it in the early morning for training so we don't have as much time to mess around. On a day like this one we can slow it down and take our time a little bit more, which gives Murphy more coveted sniff around time. This is one of those "good day" kind of mornings that sticks with you all summer until you get to try for more of them again in the fall. I am looking forward to this year more then ever.